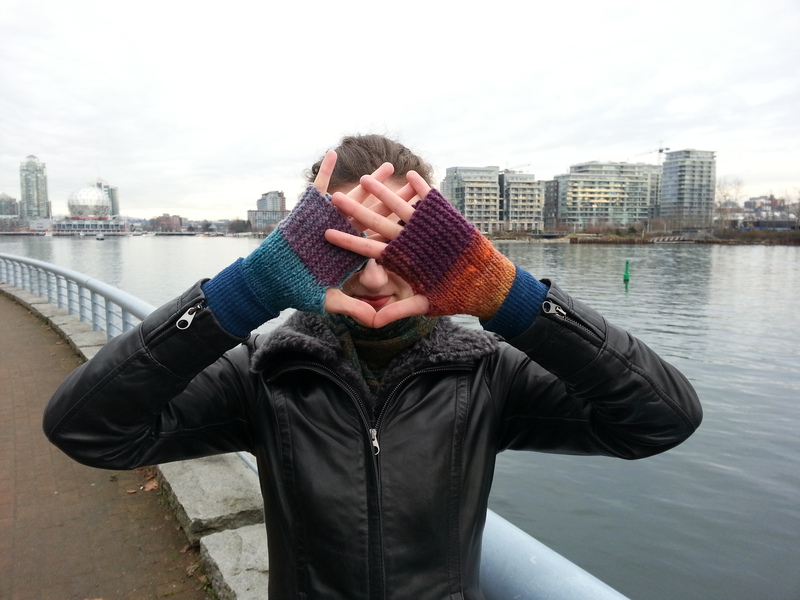 I also knit a pair of mitts for Emma in Noro yarn, using the Campout Fingerless Mitt pattern by tante ehm. 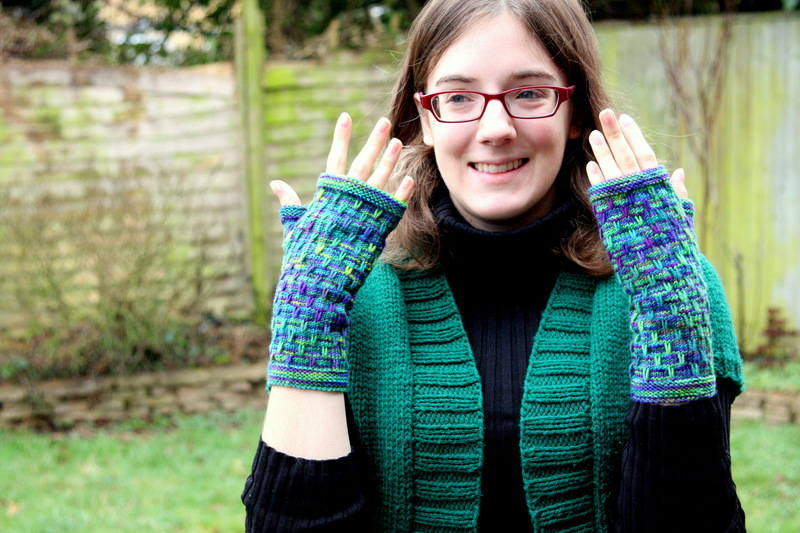 Both of these patterns are available for free from Ravelry (follow the links). 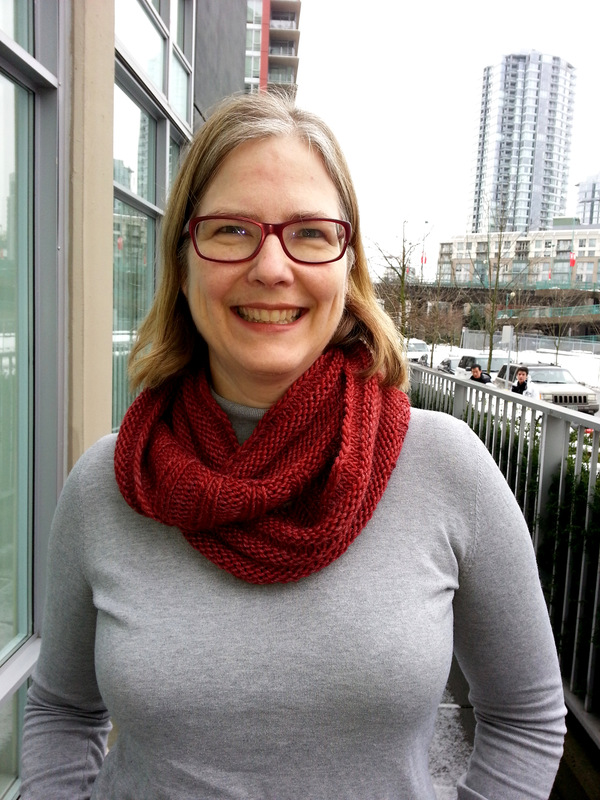 Way back in February, I knit the amazing February Scarf, designed by Beth Weaver, for Leah. 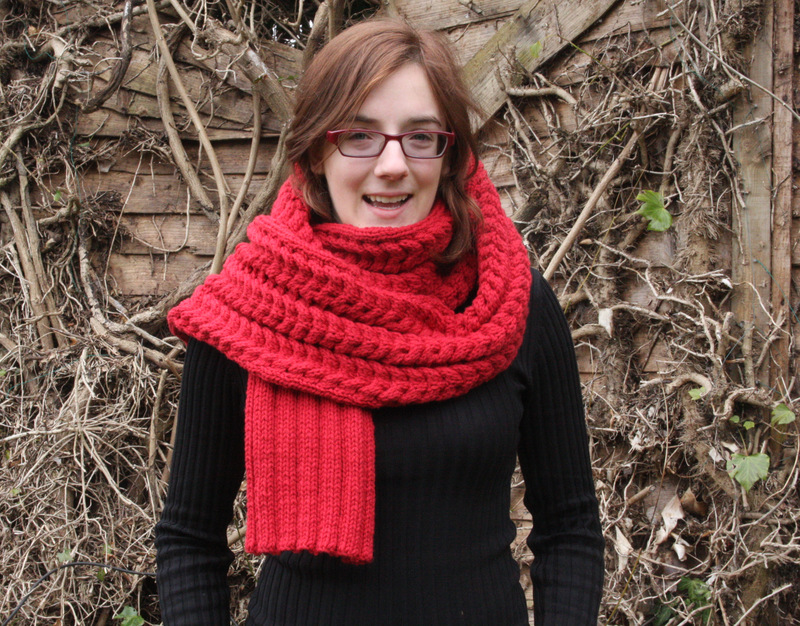 This is a very long, thick, cushy cabled scarf, knit in Quince & Co Osprey in Winesap. 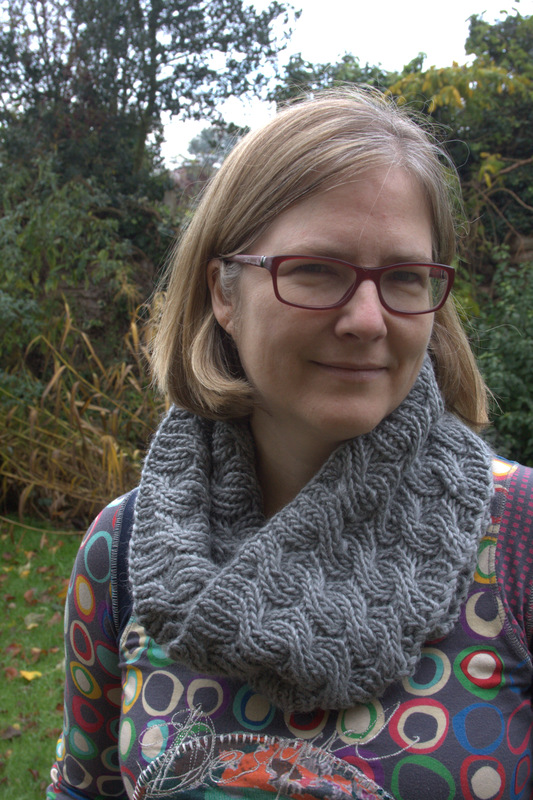 I spent four solid months knitting the seemingly endless Viajante. 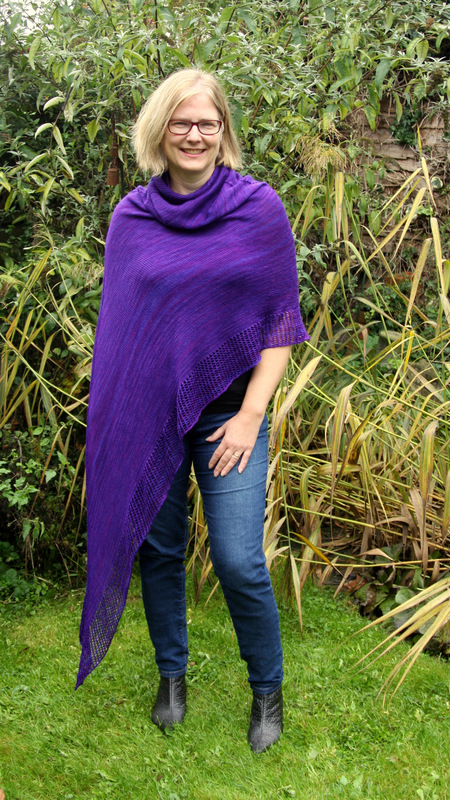 This pattern, designed by Martina Behm, is a sort of poncho/cowl/shawl, and is knit in the round from laceweight Wollweise. It goes from head to toe, and is an excruciatingly long knit. It is hard to capture in one photo, so head to this post to see it in its glory. Despite the above evidence to the contrary, I am primarily a sweater knitter. I love knitting sweaters and am passionate about fit. 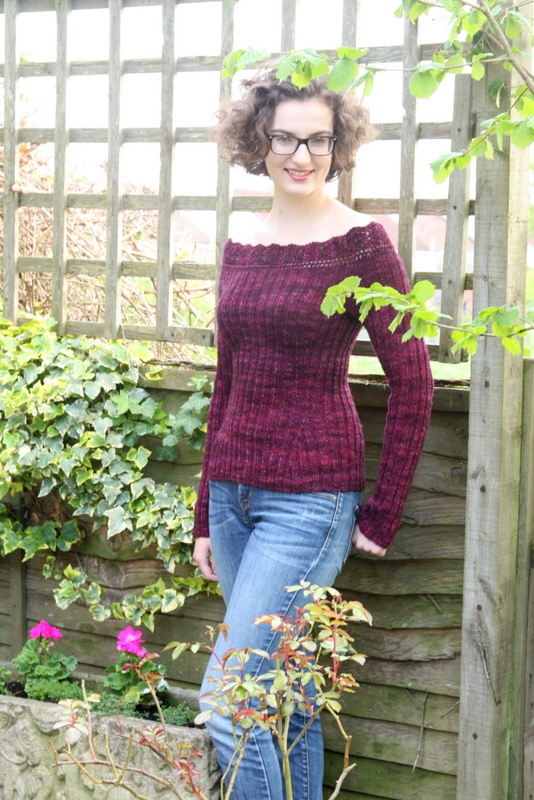 This year has been a lamentably slow year for sweaters – I only finished four. 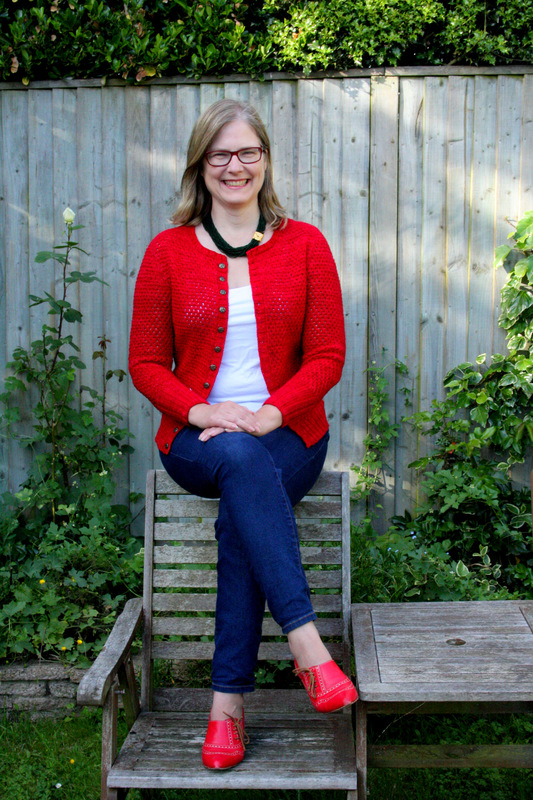 The first was the best, the amazing Audrey sweater I knit for Emma. I modified the pattern, designed by Kim Hargreaves, quite a bit (all of it documented here on this blog; search for the tag Audrey). This was without a doubt my favorite project of the year. It is knit in the fabulous Madelinetosh DK in Venetian. For lots of beautiful shots of this one, see this post. 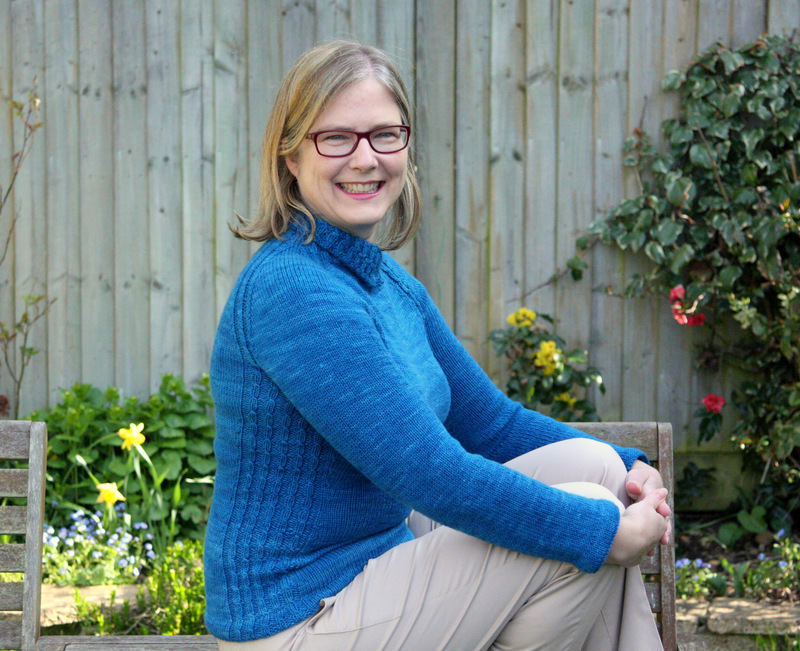 Following on this, I knit another blue sweater for myself, using the Livvy pattern designed by Tori Gurbisz. I modified it a bit, making it more fitted and changing some details, particularly the waistband. It is knit in The Uncommon Thread Lush Worsted, which is a truly lush yarn. 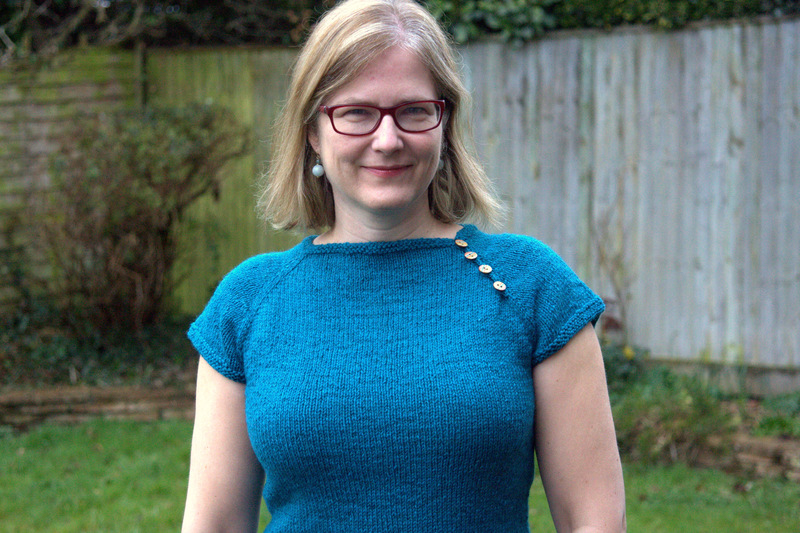 Of everything I have knit this year, this is the thing that gets worn the most. I wear this all the time. In fact, I am sure that everyone (but me) is well and truly tired of it. So that is the year in review. There was a lot going on this year – both girls going off to university, me starting business school, work being hectic, lots of travel. These things combined to mean less knitting. I thought about ending with the phrase “I had hoped to knit more, but life got in the way.” But, as we all know, life doesn’t get in the way of knitting or anything else for that matter. Life is just what happens, the good and the bad, the knitting and not knitting, and being swept along on the journey is good enough for me. This entry was posted in Main and tagged Crafts, Knitting, Year in knits 2013 by knitigatingcircumstances. Bookmark the permalink. Happy New Year! I just wanted to say that I really enjoy reading your blog. You do such beautiful work. Congratulations on going back to school and best wishes for the coming year! Thank you so much! I really appreciate your taking the time to comment. Hi Jossie! Happy New Year to you and the whole family! Lovely knits! My favourite is the Neon cardigan! Thank you! It’s certainly the one that gets worn the most. I love that gorgeous red! Happy New 2014! 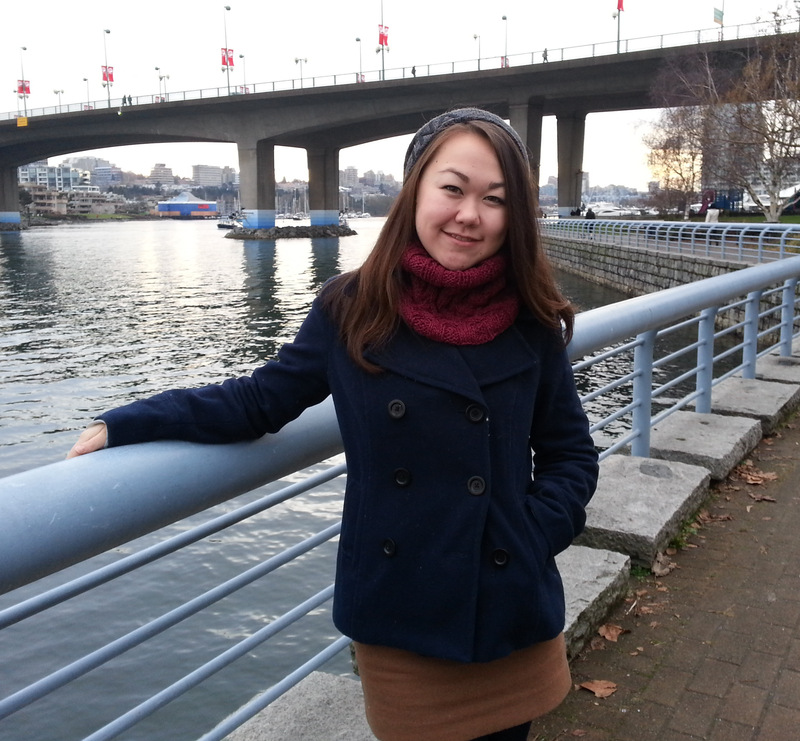 Looks like you had a wonderful time in Van with Emma and Leah. You certainly have been productive in 2013, considering your loaded schedule. After 3 months of knitting, my Soumak is finally off the needles! Now, if only I could get those pesky ends sewn in! I’ve grouped them in bunches of 10, reasoning if I do one bunch a day, I should be done in 10 days! (That said and done, I think I’ve already sewn in a hundred!) The end result, though, is stunning. I’m really happy with it. I’ve learned something new about Cocoon. If you knit it with a strand of matching Rowan Kidsilk, you’ve just upped the luxuriousness of your end result exponentially! The resulting knit has the most beautiful halo. I’m busy knitting a shrug, hopefully it will be off the needles shortly, too! I am so envious of your Soumak. I dragged mine out the other day and I am only half done. And I must say Cocoon is remarkably plush on its own; I can just imagine how fabulous it must be with some Kidsilk. Happy New Year, Ann!